WATSONVILLE, Calif. — April 1, 2016 — Logan Schuchart looked poised to claim his first ever World of Outlaws Craftsman® Sprint Car Series victory Friday night at the Ocean Outlaw Showdown at Ocean Speedway, but a late race restart put Brad Sweet in position and Sweet battled past Schuchart with 13 laps to go and claimed his fourth win of the season. “If everyone knew what Shark Racing goes through to run two cars up and down the road, hats off to them,” Sweet said. “For both of them to be up here on the podium that’s amazing and I hate to steal this win away from them, but that’s racing. For Schuchart, the disappointment of coming short of his first win was tempered by his second place finish and the third place finish of his teammate, Jacob Allen. “When we started this thing three years ago, most of these guys didn’t think we wouldn’t last the first year,” Schuchart said. “Now we’re out here in our third year. Without our sponsors and everyone that helps us out, we wouldn’t be able to be out here. The finish is his best since a second place finish at Thunderbowl Raceway in 2014. Jason Johnson, fresh off a victory at Placerville Speedway, kicked off the night, the Outlaws’ first appearance at the track since 2008, with the qualifying quick time. But it was Schuchart and Allen out front after the Dash inversion draw gave the teammates the top-two starting positions in the Dash. Allen, in the Mark Pell Tire Service/Marty Thompson Investments No. 1A, jumped around his teammate and grabbed the early lead in the Dash, as he dominated all six laps to capture the first-place starting position for the 35-lap feature. Schuchart finished in second, setting up a Shark Racing front row. When the green flag fell on the feature, Schuchart shot around Allen for the lead on the opening lap, and pulled away from the rest of the field as his teammate settled into the second position with Kasey Kahne Racing with Mike Curb teammates Daryn Pittman and Brad Sweet lurking behind. The young, Hanover, Pa. –native controlled the top spot for much of the race, leading the opening 21 laps. Unfortunately for Schuchart, winning his first ever World of Outlaws race would not be that easy. A restart just past the halfway point gave Sweet the opportunity he needed to gain on Schuchart. Sweet drove his Razorback Professional Tools No. 49 from fourth on the restart around Pittman and Allen to move into the second position, just behind the leader. Schuchart did everything he could to hold off Sweet, but Sweet had too much momentum built up on the high-side of the track and rocketed around Schuchart for the lead with 13 laps left. Sweet controlled the top spot through the final laps and held off Schuchart and Allen to capture his first victory since he won at Cotton Bowl Speedway on Feb. 26. 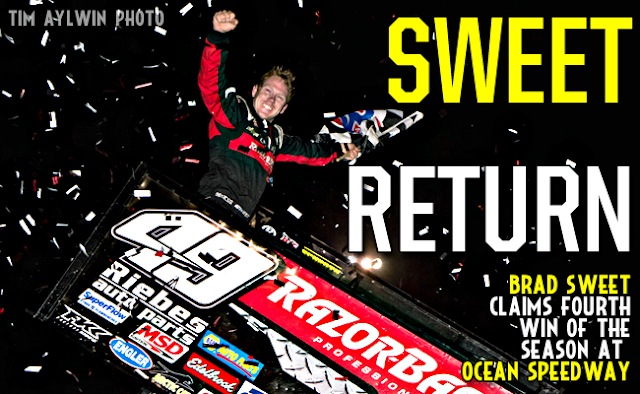 Sweet extends his championship lead to 84 points over second place Shane Stewart. Allen completed the sweep of the podium for the Shark Racing team, as he scored a career best finish of third. “With the lead that close to you, I was just going for it all and hoping to finish the race,” Allen said. “That was a lot of fun. Being up there with everybody, it means the world to me and I can’t thank everyone enough for helping us out. Donny Schatz was the night’s KSE Racing Hard Charger, advancing 12 positions to finish in sixth. The World of Outlaws Craftsman® Sprint Car Series action continues Saturday night as the series travels to Chico, Calif. for the Mini Gold Cup at Silver Dollar Speedway. Find out more information about the event at WoOSprint.com/Mini-Gold-Cup. RACE NOTES: Brad Sweet continues top five streak, only finishing worse than fifth once in 2016...Donny Schatz picked up his second KSE Hard Charger Award of the season...Jacob Allen secured his career best finish, besting his previous mark of sixth at Deer Creek Speedway on Sep. 19, 2015. CONTINGENCY WINNERS – MSD Ignitions ($25 cash): Greg Wilson; MSD Ignitions ($50 cash): Brad Sweet; Penske Shocks ($50 cash): Logan Schuchart; JE Pistons ($50 cash): Jason Johnson; VP Racing Fuels ($50 cash): Shane Stewart; Edelbrock ($50 cash): Joey Saldana; Comp Cams ($50 cash): Joey Saldana; Morton Buildings ($50 cash): Paul McMahan; Cometic Gasket ($50 cash): Bud Kaeding; Super Flow ($50 cash): Jason Sides; Craftsman/Sears ($100 cash): N/A; KSE Racing Products ($100 product certificate): Donny Schatz; Comp Cams ($50 product certificate): Brad Sweet; JE Pistons (Set of Rings): Jason Sides; JE Pistons (Set of Rings): Greg Wilson. SEASON WINNERS: Donny Schatz – 4 (Volusia Speedway Park on Feb. 14, The Dirt Track at Las Vegas on March 4, Stockton Dirt Track on March 18, Stockton Dirt Track on March 19); Brad Sweet – 4 (Volusia Speedway Park on Feb. 13, Volusia Speedway Park on Feb. 14, Cotton Bowl Speedway on Feb. 26, Ocean Speedway on April 1); David Gravel – 1 (Thunderbowl Raceway on March 12); Jason Johnson – 1 (Placerville Speedway on March 24); Daryn Pittman – 1 (Royal Purple Raceway on Feb. 27); Joey Saldana – 1 (The Dirt Track at Las Vegas on March 3); Shane Stewart – 1 (Arizona Speedway on March 6). World of Outlaws Craftsman® Sprint Car Series Statistical Report; Ocean Speedway; Watsonville, Calif.; April 1, 2016.